He uses the expression as an implicitly negative idiom, conveying something like couldn’t care less, but a bit more compactly. She peeves at him, he analyzes what she might be doing with her peeve, and eventually he uses the idiom to her. The linguablog postings have concentrated on the origins of could care less (at some point, that question becomes intellectually intriguing but no longer relevant to usage) and on the way it’s used now, about which there’s more to be said: since many speakers have both variants, there are probably subtle differences in the way the two are used. 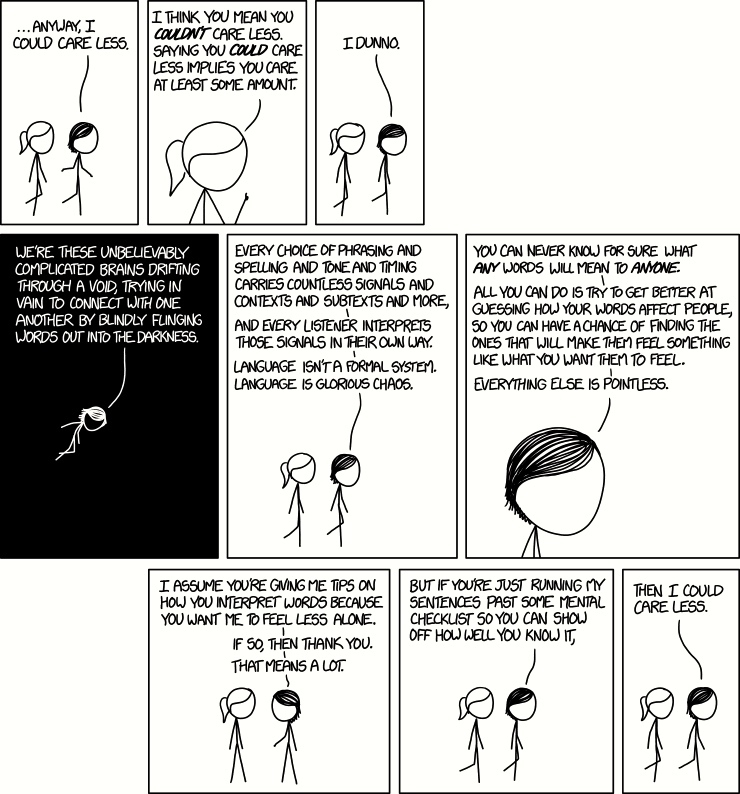 There is some suggestion, in fact, that could care less is emphatically or strongly negative, as opposed to the flatter, more neutral explicitly negative variant, in which case the man’s use of could care less in the last panel of the xkcd comic is a strong rejection of the woman’s peeving. But that idea needs to be systematically examined. This entry was posted on September 13, 2015 at 4:12 am and is filed under Idioms, Linguistics in the comics, Negation. You can follow any responses to this entry through the RSS 2.0 feed. You can leave a response, or trackback from your own site.